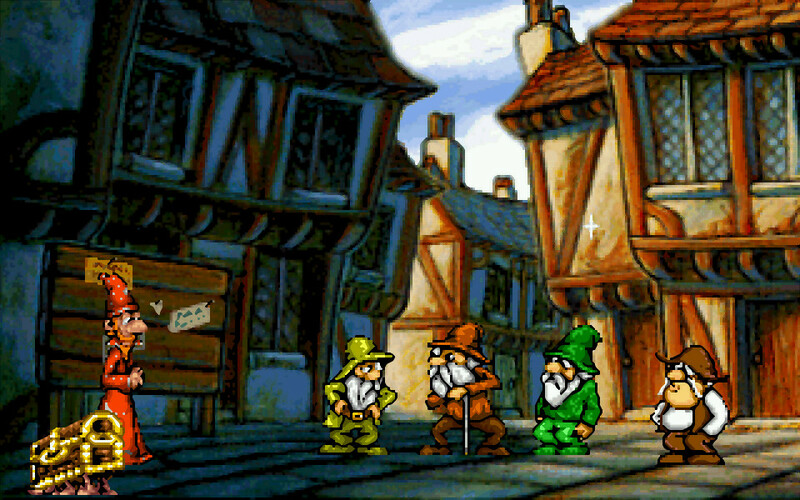 The idea for the game had originally not come from Terry Pratchett himself, who had always been very wary about adaptations of his books. It was actually game producer Gregg Barnett who had approached the author and his agent Colin Smythe when he was looking for a flagship title to launch his new company Perfect 10 Productions. Barnett had already considerable experience in game design, having joined Beam Software as a computer science student in the early 1980s and making an early adaptation of Tolkien’s The Hobbit and the Kung-Fu bestseller Way of the Exploding Fist among others. He left the company in the early 1990s after it was reduced to programming game console conversions and, together with fellow Beam Software producer Angela Sutherland, founded Perfect 10 Productions. Getting the game license for the Discworld franchise was nothing short of miraculous, but Gregg Barnett must have presented Terry Pratchett with exactly the right ingredients to convince him to let a bunch of game developers loose on his Discworld. What exactly happened has never been made public, but the author must have trusted the relatively unknown group of game creators very much – or maybe the promise of a stellar voice cast and some impressive concept art was the cause. At the same time, Pratchett seems to have had some pretty strong veto rights, even though he was just credited with the line “shouting at people”. It was not the first Discworld game, though – there was already a simple text adventure for 8-bit computers in the mid-1980s, but it was not very well known and only resurfaced when the new game came along. The story was not entirely newly created, but partly based on the first City Watch novel Guards! Guards! with the big change that Rincewind the Wizard was made the lead character. The hapless mage, the quintessential anti-hero, had become one of the most popular Discworld characters and had just appeared in 1994 in his fifth book Interesting Times, which made him the ideal choice to replace the several characters of the city watch. The story about a group of conspirators terrorizing the city of Ankh-Morpork with a dragon took some of the major plot elements of the book, but also removed the whole city watch angle to make room for Rincewind as the hero. The story does not fully adhere to the Discworld canon, but at the same time there was not much inherently wrong with how the Discworld universe itself was handled. 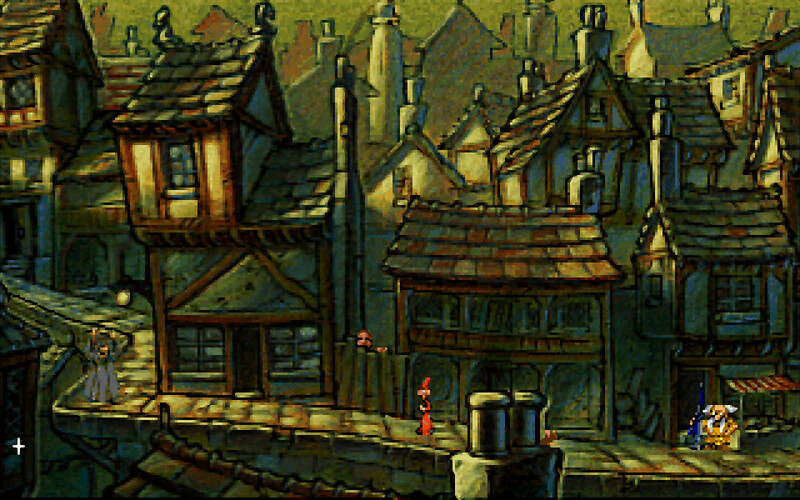 The game was produced at a time where some companies had already switched to 640×480 graphics, but Discworld seemed to have been so long in development that it had missed the revolution and was still created with the lower 320×200 resolution, The graphics were nothing short of amazing, though – the backgrounds were hand-painted and then scanned, sporting a slightly cartoonish style somewhat resembling the book covers from Josh Kirby. This was not pixel art, but real painted artwork bringing the medieval atmosphere of Ankh-Morpork beautifully to life – apart from the cover illustrations, this was the first time the Discworld had been visually represented and it looked fantastic despite the very low screen resolution. 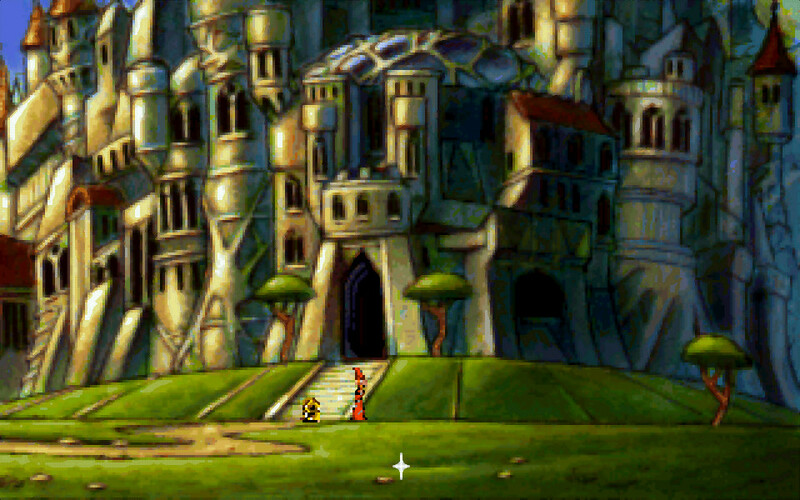 The characters and their animations were also hand-painted, but more pixel-refined than the backgrounds. The style was a perfect choice for the background graphics and made the most of the tiny resolution available without appearing too digital. The surprisingly dynamic animation was as good as the technology of the mid-1990s allowed and certainly on the level of the competition – the character figures even have a bit of life of their own with some basic animation that only sometimes looked a bit repetetive. 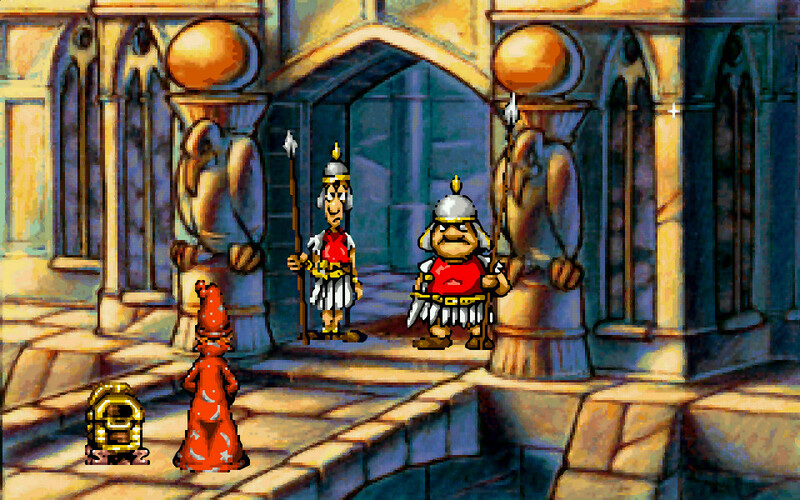 Especially Rincewind with his red robe and floppy hat was exactly what most readers must have imagined him to look like and other characters from the Discworld canon making guest appearances are also instantly recognizable. The most fun character to watch was, however, the luggage – the trunk with lots of pink feet underneath ambled around Rincewind all the time, serving as the player’s storage locker. As an independent group, the game programmers had no other choice as to create their own game engine, which was maybe the biggest and only downfall of the game. The Tinsel Engine was simply not quite ready when the game was shipped, sometimes resulting in graphical quirks or even game crashes, but to be fair this did not happen very often. The actual game story design was quite good, although many of the puzzles were extremely hard to solve even if you had a good knowledge of the Discworld universe. 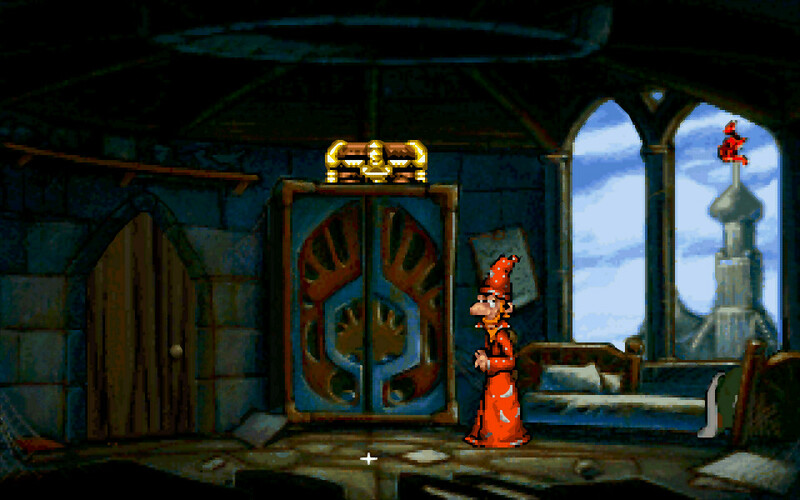 It seemed that Gregg Barnett had taken quite a few ideas from LucasArts, Sierra and other adventure developers and then got a little bit too enthusiastic – while it was not possible to kill Rincewind or to get into a dead end, the logic behind some of the puzzles was sometimes more crazy than the Discworld itself and hearing Rincewind say “THAT DOESN’T WORK!” for the umpteenth time could be a bit frustrating. But the somewhat convoluted plot had the advantage that it allowed the player to explore many locations in and even sometimes out of Ankh-Morpork, which was practically half the fun already. 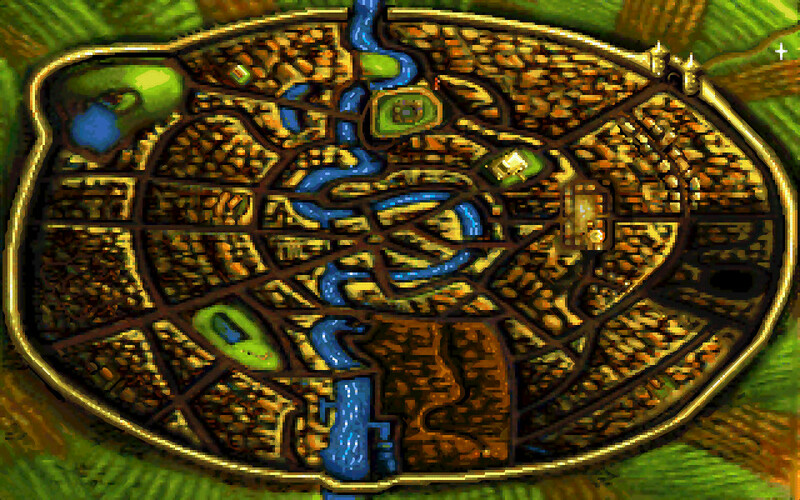 Like the book it was based on, the game is an hommage to Ankh-Morpork, celebrating the strange twin city with a beautiful top-down map mostly accurately based on the actual printed one, which was published two years before the game hit the shelves. 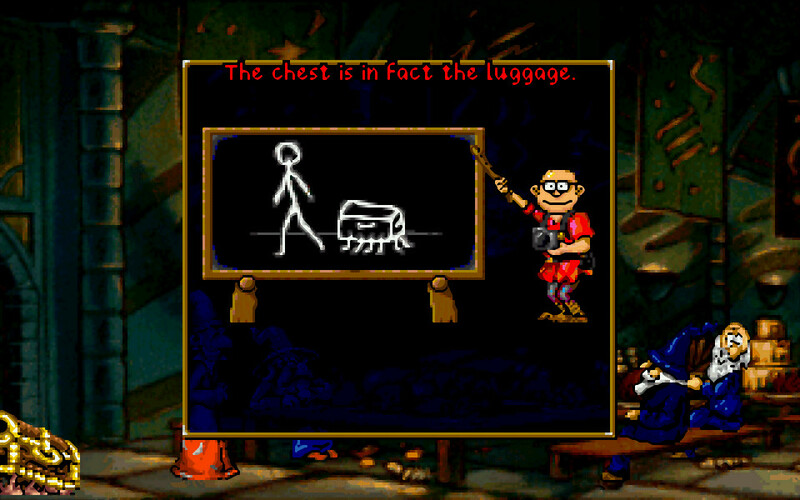 The one-click user interface did not bother with a verb list and allowed the artwork to spread over the whole screen while making the gameplay as easy as possible. 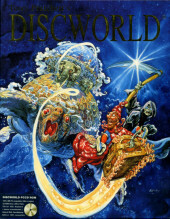 Although a floppy disk version was also made, the game’s main selling point were the voiceovers of the CD-ROM edition – with very good reason, because this was what made the game practically into the first Discworld movie. Getting a huge comedian like Eric Idle to appear in your game does not happen every day, but Gregg Barnett had somehow managed it and also got Australian writer Paul Kidd, a fellow Beam Software colleague, to write lots of python-esque dialoge for him – with Terry Pratchett reportedly having helped out a little bit too. 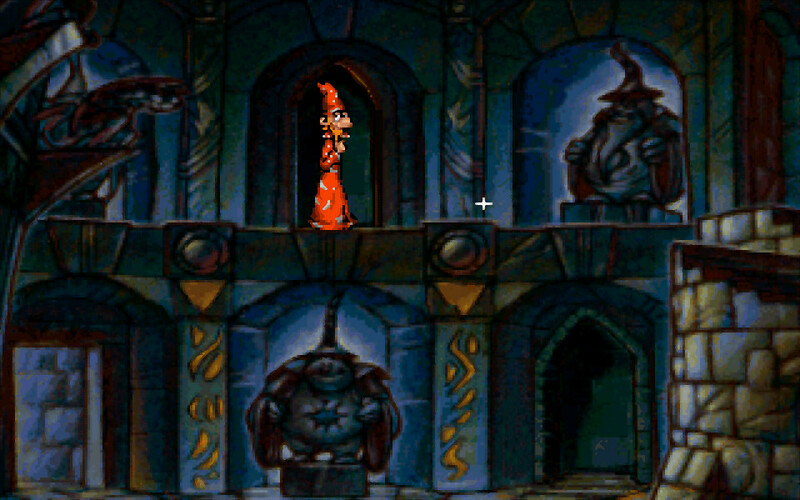 Although Eric Idle had most probably recorded his text alone from his Los Angeles home in the US, he sounds quite brilliant as Rincewind, relying on his sarcastic and cynical side to bring Rincewind’s world-weariness to life. Idle has probably more dialogue here than in an average movie and often goes into longer monologues and even rants, which sometimes seemed to be improvised, but never became boring. His fellow voice actors, who all handled multiple roles, were also nothing short of amazing: Tony Robinson, who had already narrated many abridged Discworld audiobooks was recruited for a number of characters – mostly delightfully unrecognizable, but sometimes his Baldrick still shone through. He was was joined by none other than former Doctor Who Jon Pertwee, who took the more rustic characters like the wizards, while singer, actor and comedian Kate Robbins had her experience from several years of working for Spitting Image to give the female roles a certain twist. A then almost unknow comedian called Rob Brydon also helped out with many of the minor characters. All this made the Discworld adventure an amazing experience to listen to, especially with the huge amount of extremely funny dialogue buried deep in the story, which the player did not even need to listen to in its entirety to complete the game. The aspirations to be a movie in addition to a game are also reflected in quite a lot of ‘cutscenes’, which only had some limited animation, but were really brought to life by the voices. The long intro sequence almost faithfully recreated the beginning of Guards! Guards! and started right with the typical Discworld humour complete with a narrator in the style of David Attenborough. Smaller scenes, including short explainers with said Attenborough-esque lecturer about crucial Discworld facts, were sprinkled through the whole game and it feels like the developers had originally much more of that in mind, but ran out of time to produce more. 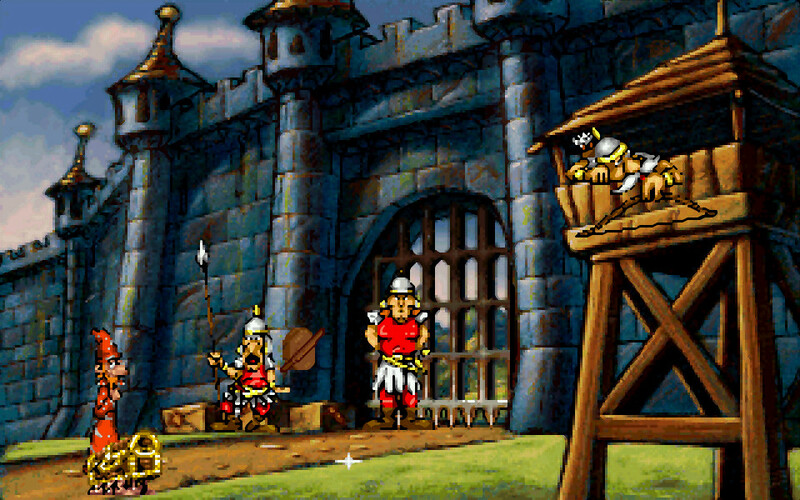 Despite some shortcomings in the ‘movie’ department, the quirky humour was still the main element driving the game and while not all gags really work well, they fit nicely into the written Discworld universe. The musical accompaniment came in the shape of General MIDI tracks, which was still a standard in the mid-1990s before the larger filespace of CD-ROMs allowed game developers to use digitally sampled audio. Written by British composer and musician Rob Lord, the mix of medieval tunes with a comedy edge was surprisingly melodious and offered many memorable tunes from mysterious and creepy sounds to downright funny romps. Unfortunately the music was not changing dynamically and was just played in loops, but it still contributed much to the unique atmosphere of the game. A good soundcard with a proper wavetable synthesizer was required to make the music sound really good, though – on a standard Soundblaster FM OPL3, the music was a bit of an disappointment. Luckily, this is not a problem anymore today and there is even now a professionally, digitally re-recorded version of the soundtrack. Twenty years after its release, Discworld is still a surprisingly good game worthy of being mentioned in the same sentence as other classics from LucasArts or Sierra. 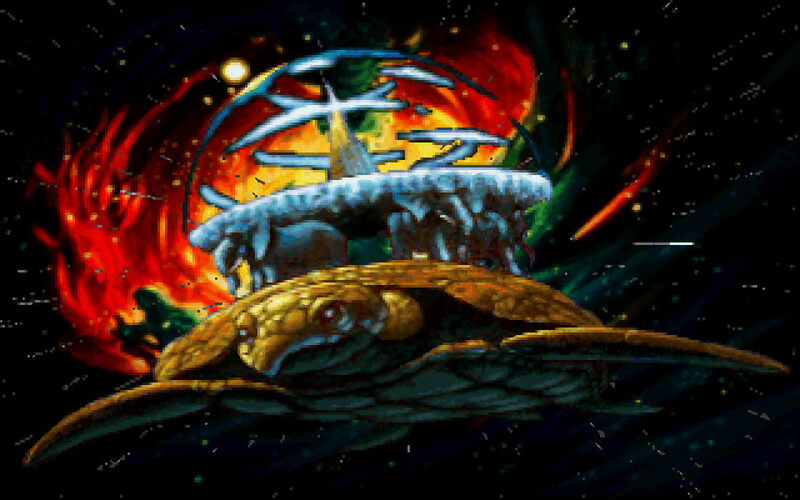 While it was certainly not the first game with a wizard as the main protagonist – Simon the Socrerer perhaps being its immediate predecessor – it was much more than just a run-of-the-mill Adventure with a Discworld label slapped on it. This was a labour of love, made by a group of people who really understood how Terry Pratchett’s unique universe worked. 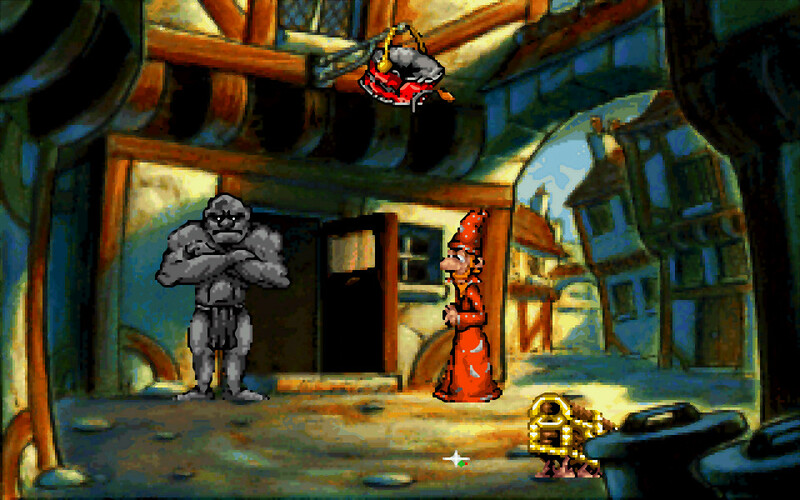 Despite some minor flaws and being devilishly difficult, the first proper Discworld adventure game played more like a long animated movie, a couple of years before the first television adaptations arrived. It became a moderate success, earning mostly good reviews that paved the way for two sequels, one of them turning out even better than the original – but that’s a whole other story. Today, Discworld can easily be played with the help of ScummVM. The ‘Tinsel’ engine was added some time ago and the game works better than with the original interpreter across multiple platforms including mobile devices. Sadly, there is no way to buy the game legally except second-hand at the moment, but the ScummVM team is reportedly negotiating to make it freeware – although this might be difficult because of the intellectual property rights tied to it. There are already numerous abandonware sites around that host working copies of the game, but for copyright reasons I’m not able to include any links here – although it is easily findable. Hopefully a budget download release on websites like Good Old Games will come sometime in the future. All screenshots were made with ScummVM utilizing the HQ3x filter. The cover art was scanned from my own box of the European release.